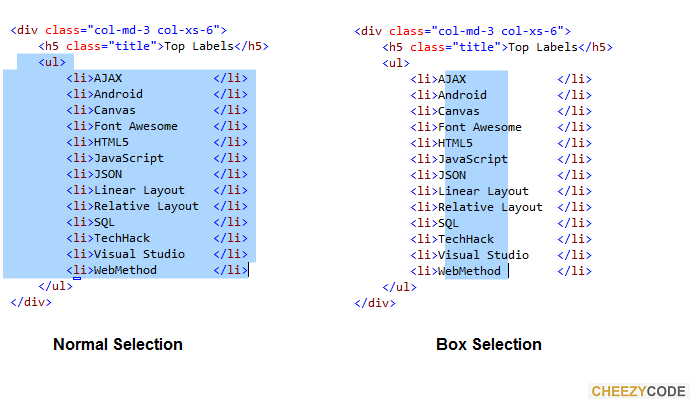 How To Use Box Selection? There are two ways of doing it. One by using mouse and another by using keyboard. For selection by mouse: While a normal selection is done by clicking left mouse button and dragging over the text, box selection is done by pressing ALT key together with left mouse button and dragging. For selection by keyboard: All you have to do is press ALT & SHIFT keys together with arrow keys to select whatever area you want to select. Congrats to all Contributors , Keep on blogging and sharing the things to the world :).